AFTER BEING SIDELINED, Oxendine Molliver spent meeting after meeting ushering guests to the refreshments, but at a final meeting held just for tribal members, on June 27, she was struck by images presented by Sheila Lamb, who is Ojibwe and Cherokee and has long been involved in environmental activism. They showed long lines of pipe being transported by truck and rail, and stacked inside a fence. “Is this already a done deal?” Lamb asked the Commerce Department officials. Her question touched issues that extended beyond the scope of the environmental impact statement. Enbridge has already started construction in the Canadian provinces of Alberta and Saskatchewan, as well as on the 12-mile segment in Wisconsin. Minnesota is the last state that hasn’t granted regulatory approval, giving it huge sway in determining the future of the pipeline. At the meeting that led Enbridge to complain about Oxendine Molliver, Winona LaDuke, a longtime environmental activist who played a key role in the movement to kill Sandpiper, described her takeaways from the draft environmental impact statement. “When you go all the way through it, it says, we heard you. We heard that your people are hurting. We heard that your people can barely hang on. We heard that this is the only land you have. We heard that this is the only wild rice you have. We heard that your communities are already under a lot of duress. We heard that your communities are already sick from contaminants,” she said. “But mitigation is gonna be good. Opponents of Enbridge Line 3 publicly launched two camps on Wednesday, one on the White Earth reservation and another near the Fond du Lac reservation. The final decision on the pipeline isn’t expected until next April. Resistance against Enbridge’s Line 3 Pipeline expansion is ramping up. Near the Fon du Lac Reservation, at the frontline camp, Makwa, water protectors, land defenders, warriors, and others have participated in a wave of civil disobedience that has resulted in 16 arrests in multiple actions that have delayed construction work on the pipeline in the last month. On the morning of September 18, Unicorn Riot covered another direct action to stop construction on the Wisconsin side of the Minnesota-Wisconsin border. 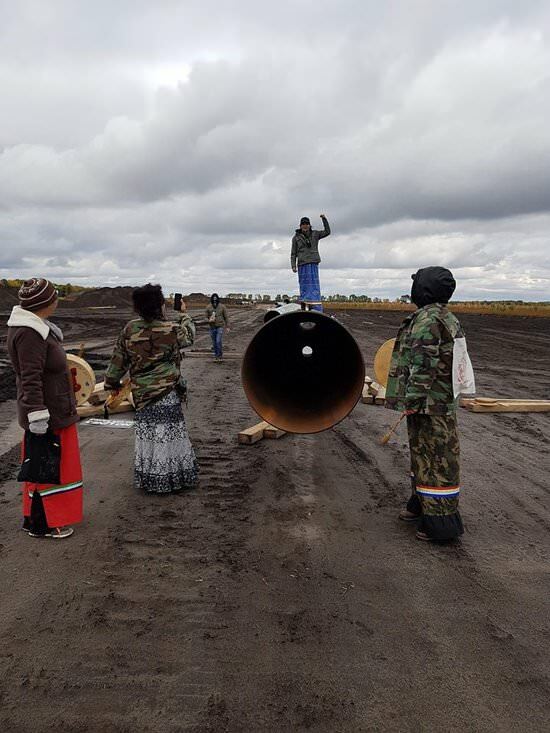 On November 14, 2017, five water protectors took action in solidarity with front line Indigenous resistance efforts at Camp Makwa to stop the construction of the Enbridge Line 3 tar sands pipeline in Minnesota. The activists locked down to each other and used their bodies to disrupt business as usual at Wells Fargo, one of the major financial players behind this genocidal, extractive fossil fuel project. 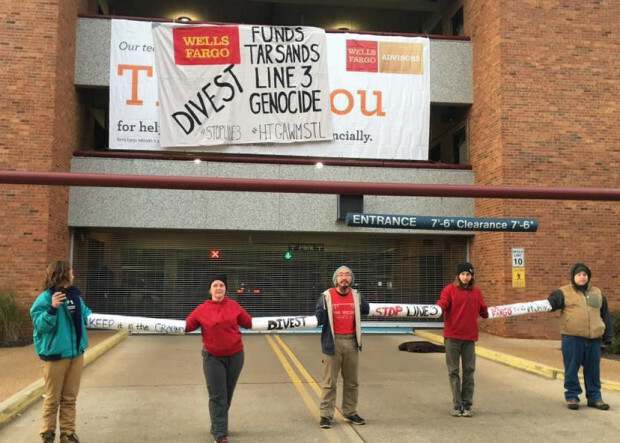 Wells Fargo has 743 million invested into Enbridge who is responsible for Tar Sands and the Line 3 pipeline threatening and ravaging through Indigenous lands, water, wild rice, and sovereignty in Minnesota. This action is one of hundreds taking place across the globe to call for divestment from financial institutions invested in the destructive fossil fuel industry. 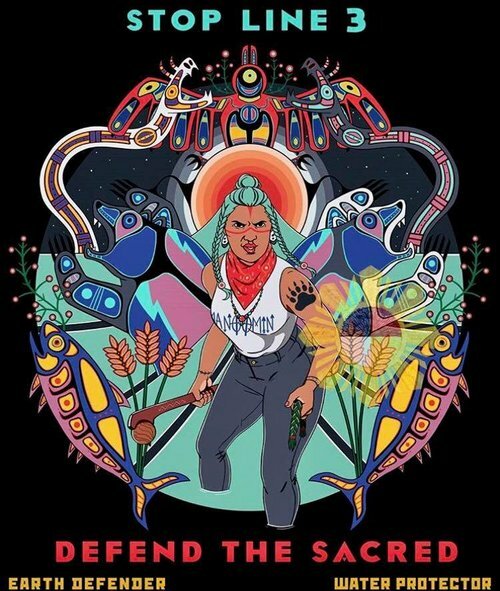 In support of this mandate, we hosted a speaker panel, “Beyond Borders: Pipeline Resistance From Standing Rock to Manitowapow” – bringing together legal, grassroots, and frontline perspectives. Following the success of this event, we are pleased to launch our next “Water is Life” Fundraising Campaign. Minneapolis, MN — Today, a coalition of Indigenous, national and international groups join a growing movement placing pressure on financial institutions to drop financially and socially risky projects, delivering a group letter to the 36 banks providing corporate finance to fossil fuel infrastructure giant Enbridge. The groups are calling on the banks to cut business ties with Enbridge Inc. until it stops expanding tar sands operations, one of the most destructive fossil fuels on the planet. Enbridge is the company behind the Line 3 “Replacement” Pipeline project, a controversial project that would cause Indigenous rights abuses and continued contributions towards climate change. Minnesota decided to approve Line 3. The last route hurdle resolved. Line 3 is a done deal. Awesome graphic on #19. I don't know if the price is right to sell oil now anyway. I suspect if we wait for a bit, it will be much higher. However if the pressure stays on and more oil projects are abandoned, renewables will start climbing up as their cost goes down. What Alberta might be able to do for itself is start acting like the US Department of Energy and say they will get the oil to market, whatever it takes. You find an energy source, and we will plug it in. I think it would make the second-tier oil companies start piling in again. That is exactly what Trudeau is trying to do by declaring Transmountain will be built. It isn't working because it isn't solely up to him. Alberta is land-locked. ..line 3 is still not approved in minn. the final step will take place in june when the regulatory commission decides on 1) Certificate of Need, and 2) Route Permit. An administrative law judge on Monday recommended Minnesota regulators approve Enbridge's contentious Line 3 oil pipeline proposal, but only if it replaces the existing line in its current location — not a new route as Enbridge has proposed. In her decision, administrative law judge Ann O'Reilly cited integrity concerns with the current Line 3, which, at nearly 50 years old, is corroding and cracking, putting it at greater risk of leaking. Her recommendation is non-binding. The judge's report said building the Line 3 replacement along a new route has more consequences than benefits for Minnesota. However, the "cost-benefit analysis" changes if Enbridge routes its replacement pipeline along the current Line 3 route. There were over 72,000 written comments submitted on the Line 3 project, according to O'Reilly's report, 68,244 of which opposed the pipeline. The new route swings around the Leech Lake and Fond du Lac reservations. But it crosses through land where Native Americans have hunted, fished and gathered for centuries, land dotted with some of the cleanest lakes in the state, some of the richest yielding wild rice waters in the state, and the headwaters of the Mississippi River. That has raised sharp objections from conservation groups and Indian tribes. They point to major spills in Minnesota in 1991 and 2002, and more recently to the 840,000-gallon Kalamazoo River spill that required a $1.1 billion cleanup. They say the risk of a similar spill in northern Minnesota is too great. In surprise testimony last September, the state Department of Commerce said Minnesota doesn't need the pipeline, in part because refineries in the state and the Midwest already receive all the oil they need. If the project is approved, some opponents have threatened a repeat of the protests in North Dakota near the Standing Rock reservation that delayed work for months on the Dakota Access pipeline, in which Enbridge owns a stake. Similar concerns over the role of tar sands oil in climate change, and indigenous rights, have fueled opposition to Kinder Morgan's proposal to expand its Trans Mountain pipeline from Alberta to an export terminal in British Columbia. Enbridge's oil pipeline was old, unreliable and prone to leaking. Its proposed replacement had federal approval in Canada and a presidential permit in the United States. That's why compared to the other oil export projects proposed from Alberta — TransCanada's Keystone XL and Kinder Morgan's Trans Mountain expansion — this pipeline was assumed to face far fewer hurdles. And the real protests haven't even begun. "I would have thought Line 3 would have had the easier time moving forward," said Jennifer Rowland, a senior equity analyst with Edward Jones, based in St. Louis. "And yet, a line like that even faces so much opposition. It speaks to the mindset and attitude toward pipelines." This week, an administrative law judge in Minnesota delivered a report for the state Public Utilities Commission (PUC) on Enbridge's application to replace and expand the Line 3 pipeline. Instead of providing a clear verdict about whether the pipeline should be approved, the report complicates the situation even further. The PUC will make the final decision on the project in June. Experts say the commission often follows the recommendations it receives. "There's a ton riding on this project — not only for Enbridge, but for the whole basin, in general, in Western Canada. It's a very important project," said Patrick Kenny, an analyst with National Bank in Calgary. The Canadian portion of the project will cost an estimated $5.3 billion Cdn, while the American section has a price tag of $3.6 billion Cdn. The judge suggested Enbridge construct a new Line 3 parallel to the existing pipeline, which travels through territories of the Leech Lake Band of Ojibwe and the Fond du Lac Band of Lake Superior Chippewa. Both Minnesota Indigenous groups oppose the project and both have existing agreements with Enbridge that expire around 2029. "That definitely creates a pretty big wrinkle here as far as what the regulatory agency might decide to do in June," said Rowland. "There is opposition to the pipeline in some of those tribal areas that the existing corridor already goes through. So I think for the sake of speed of permitting, they prefer a different route." Enbridge had suggested a different path through the state, which would reduce the environmental impact, the company said. According to the report, the existing pipeline corridor would isolate the risk of a spill, prevent the establishment of a new pipeline corridor in an environmentally sensitive part of the state and "prevent the abandonment of nearly 300 miles of steel pipeline." Enbridge proposed to clean and decommission the existing 1960s line before leaving the steel pipe in the ground. However, the judge recommends Enbridge remove the old pipe, which would increase costs for the company. Enbridge appreciated how the report stressed the need for the project, but the company disagreed with the routing decision and will keep pushing for its preferred route.. On Tuesday, the day after the report was released, the company's shares fell more than five per cent. The bright spot for Enbridge is the judge's belief the new pipeline is needed in Minnesota. After this long winter, it’s time to party! So join us for our Block (Line 3) Party on May 18-19! 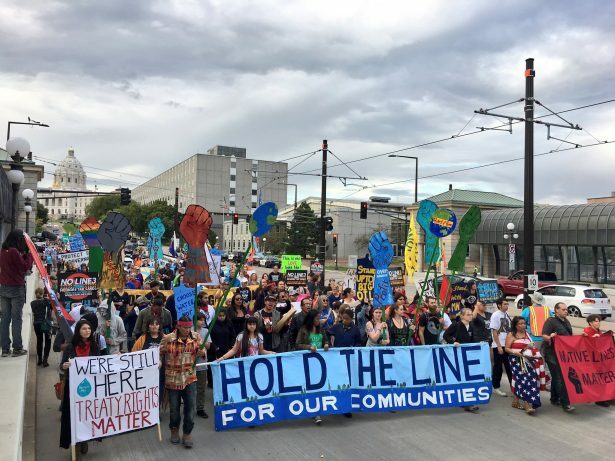 We’ll be encouraging our Public Utility Commissioners to #StopLine3 as they contemplate their final rulings on this pipeline, rulings that could have devastating consequences for years to come. Have you ever attended a water ceremony? When was the last time you had wild rice casserole made by Minnesotans who live near the wild rice beds where it’s been harvested? Come join us for a weekend of all these things and more! Meet others like yourself who care about the future of our northern communities being at stake, in addition to the water that all of us hold near and dear every day. The Canadian oil pipeline company responsible for one of the largest inland oil spills on record has agreed to pay a $1.8 million fine for failing to thoroughly inspect its pipelines for weaknesses as required under a 2016 agreement. More than 1 million gallons of tar sands oil spilled into the Kalamazoo River near the town of Marshall when a 6-foot rupture opened in Enbridge pipeline 6B. Despite warnings of trouble, oil flowed for 17 hours before Enbridge shut down the pipeline. Ultimately, the oil pushed nearly 40 miles downriver, fouling 4,435 acres of land near the river's banks. It triggered a massive cleanup effort that cost the company $1.2 billion and kept the river closed for nearly two years. As part of a sweeping, $177 million settlement, Enbridge promised to look for cracks and corrosion on its Lakehead pipeline system, a nearly 2,000-mile grid of pipelines that brings oil from Canada into the United States. In a document filed in a Michigan federal court on Tuesday, the government alleges that Enbridge failed to properly conduct six inspections. The new settlement comes at a time when Enbridge is facing questions over the integrity of its Line 5, which runs under the Straits of Mackinac that connects Lake Michigan and Lake Huron in northern Michigan. Nice of the Americans to let us pump more of our (oh sorry, Alberta's) diluted bitumen over their territory on its way back to refineries in Ontario. That seems really dumb from an American point of view. 100% environmental risk, 0% hydrocarbon reward. Who said OK to that? County officials in northern Minnesota are worried about large-scale protests if Enbridge Energy gets approval to replace its Line 3 crude oil pipeline and have asked regulators to find a way to force the company to cover the costs to local governments. 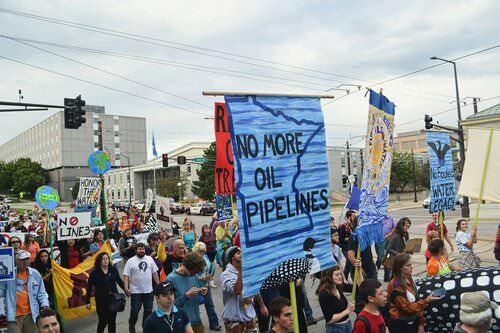 More than 500 religious leaders have signed a petition against Enbridge's proposed new oil pipeline across northern Minnesota, with several delivering a letter Monday afternoon to Gov. Mark Dayton and state utility regulators. The letter, signed by regional Protestant leaders and ministers of several faiths, called the proposed new Line 3 a "moral issue" — a threat to the environment and Minnesota's Ojibwe. "The threat of spills in these water-rich areas puts this project in violation of indigenous treaty rights to hunt, fish and gather," Julia Nerbonne, executive director of Minnesota Interfaith Power and Light, said in a news release. The group of over 400 congregations works on sustainable energy and global warming issues. Signatories of the petition include the bishop of the Minneapolis Synod of the Evangelical Lutheran Church in America (the nation's largest Lutheran synod); the bishop of the Minnesota-Dakotas region of the United Methodist Church; the bishop of the Episcopal Church in Minnesota; and the head of the Minnesota Conference of the United Church of Christ. More than 100 protesters affiliated with the religious leaders' petition congregated Monday in a park near the State Capitol. 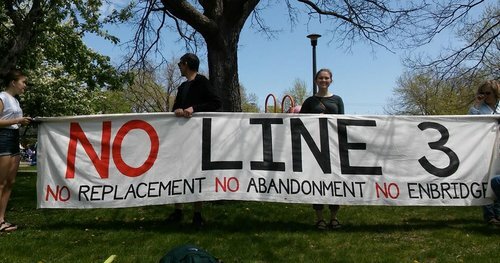 Yesterday, Friday, June 22, Enbridge submitted a document to the Line 3 docket outlining the 5 last-minute promises they’ve made recently in desperate attempts to push the PUC to approve their proposed new corridor. In that document, they propose a “Landowner Choice Program” to determine where to remove the old Line 3 pipeline. Their plan is to send each landowner a letter asking them if they want Line 3 removed from their property. That sounds reasonable enough. But deep in the document, Enbridge also says they plan to offer each landowner money to let them leave the corroded, leaky pipe in the ground. Workers left the site. Enbridge Line 3 construction northwest of Morden/Winkler, Manitoba. Opponents of Enbridge’s plan to replace its aging Line 3 crude oil pipeline across northern Minnesota filed appeals Wednesday to challenge the state Public Utilities Commission’s approval of the project. The appellants will also include the Youth Climate Intervenors, a group of 13 people ages 25 and under that was granted official “intervenor” status in the commission’s proceedings. They plan to file their appeal before Friday’s deadline.